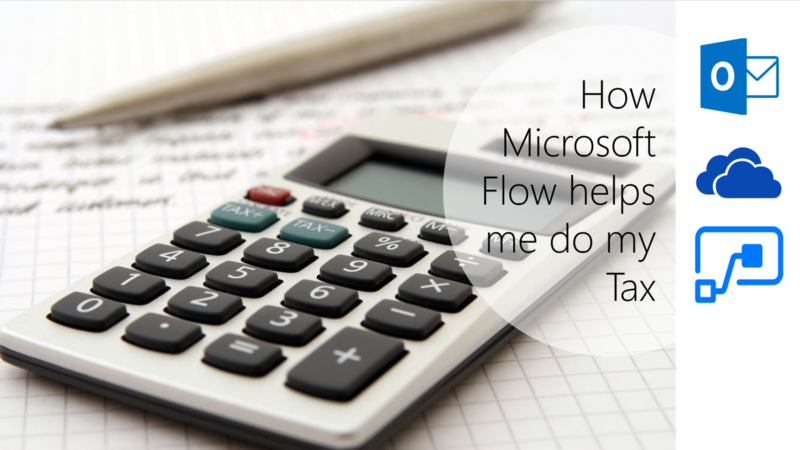 #Microsoft365 #Office365 #MicrosoftFlow #MSFlow I don’t know a single person who likes doing their tax. That twice a year running around finding information is a pain to say the least. I use Microsoft Flow to help me gather my information as it comes through my Inbox and store it where it should be for access later. To all my non-techie friends, you could have this for a very low monthly cost. Office 365 is truly affordable, speak to me. I’ll help. When I receive mails from Standard Bank I want Flow to save the attachments (bank statements / tax certificates / invoices) to a specific folder on OneDrive for Business. You can access Flow either by going to Office.com or by navigating to Flow.microsoft.com directly. 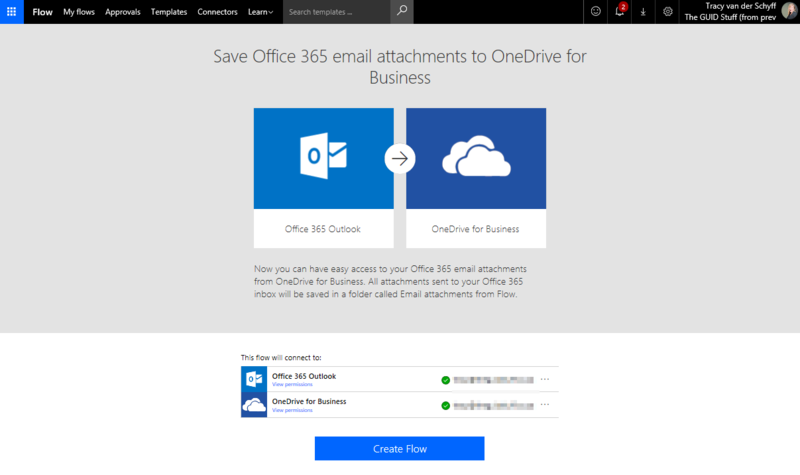 Under templates you’ll find “Save Office 365 email attachments to OneDrive for Business”. Keep in mind you can do this for other mail clients (Gmail) as well as other storage platforms (Dropbox, Google Drive, Box, SharePoint). Because you’re signed in already, your credentials should authenticate for the connectors you would like to use. If not, sign in to them first. The trigger for this template is “On new email”. Ensure that Importance is set to “Any” or it will miss mails with different settings. Now add a condition above “Create File”. I’ve created a filter that it should only save attachments from mails that contain the word “Standard Bank” in the body. I have many accounts with Standard Bank and they use different mailboxes to send from, so for me this is the safest way to capture all. Yes, I might save a couple of newsletters in there as well, but that’s ok.
Once the condition is added it will show a Yes / No possibility. I’ve dragged the “Create File” into the Yes section. 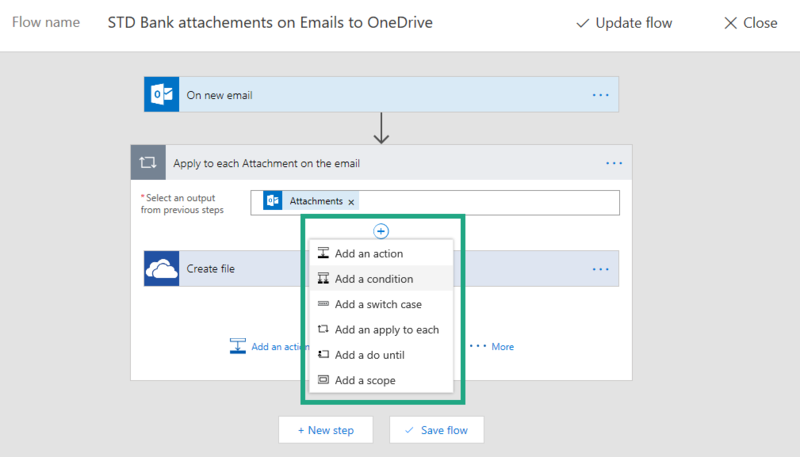 In “Create File” select the folder in OneDrive where you would like to save your attachments. I’ve added the Attachment ID before the file name to avoid replacing the same file with the same name. Make sure you add it before and not after or the file extension will be lost. Save your Flow and click Done to publish. Now when I receive mails and the body contains Standard Bank it will save the documents to OneDrive for Business. Have to say it does save some other garbage as well, like email signature images etc. I’ll strip this out next. The document name is also very long to make it unique, will figure something out, I’m sure I can concatenate a string that uses Date & Name.